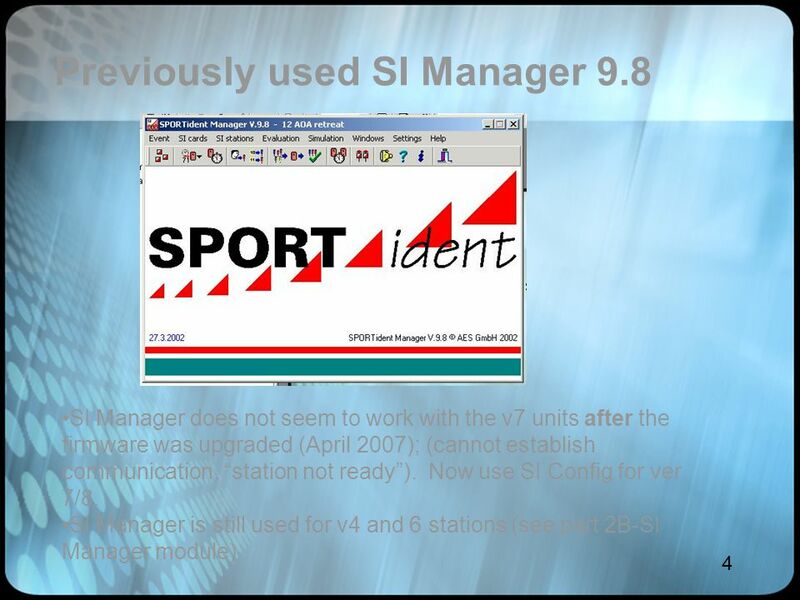 1 Sport-Ident 102 Barry McCashin Edmonton Overlanders Orienteering Club Jan 18, 2009 UofA-Biosci © BGMcC 2009 Part 2A: Program SI units 55 slides. 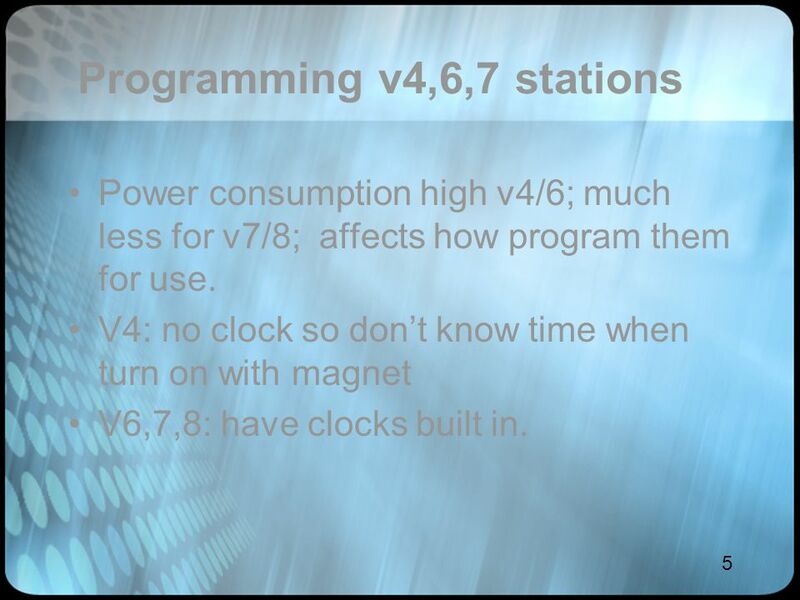 5 5 Programming v4,6,7 stations Power consumption high v4/6; much less for v7/8; affects how program them for use. 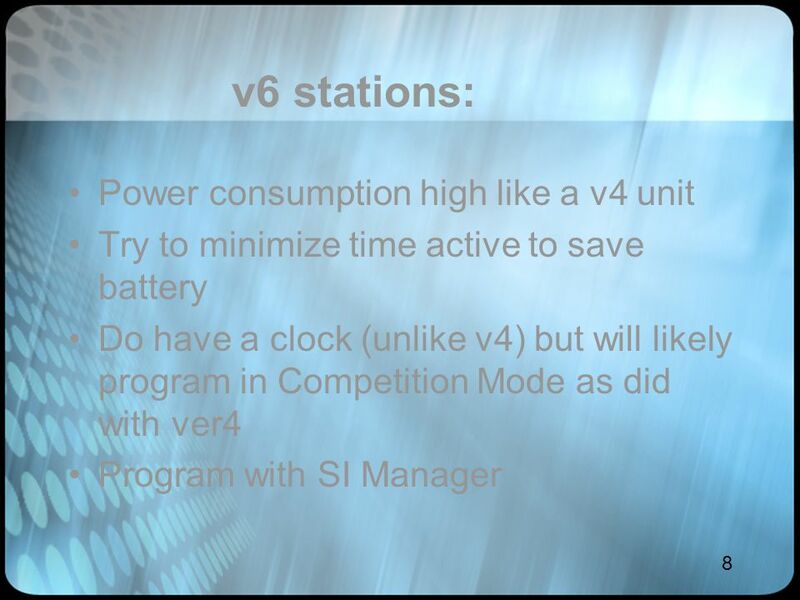 V4: no clock so don’t know time when turn on with magnet V6,7,8: have clocks built in. 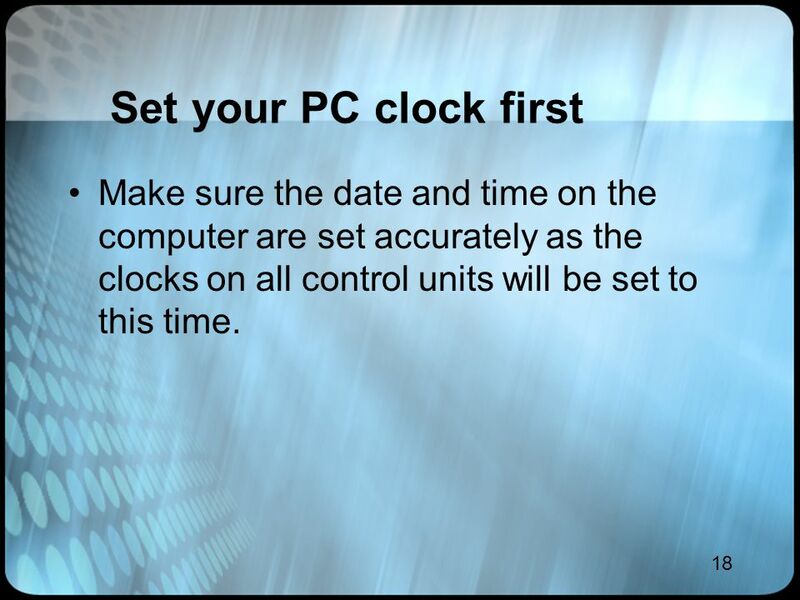 18 18 Set your PC clock first Make sure the date and time on the computer are set accurately as the clocks on all control units will be set to this time. 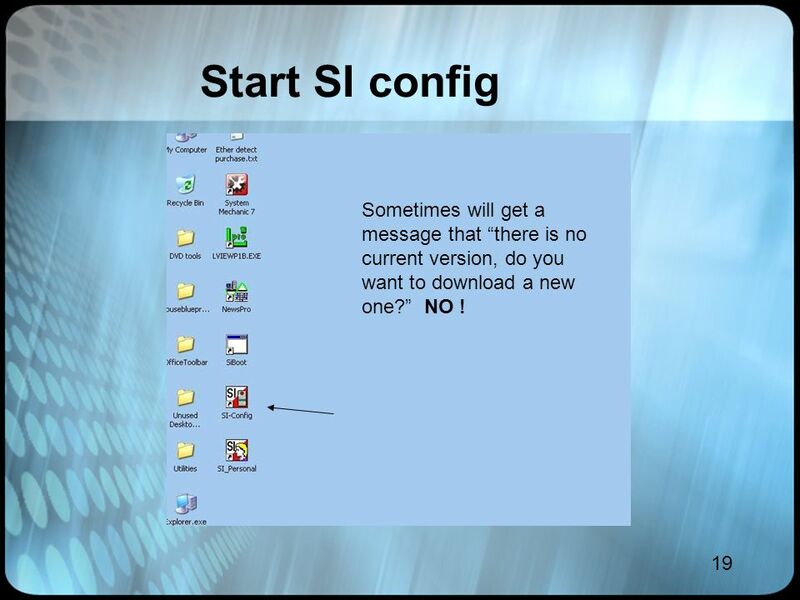 19 19 Start SI config Sometimes will get a message that “there is no current version, do you want to download a new one?” NO ! 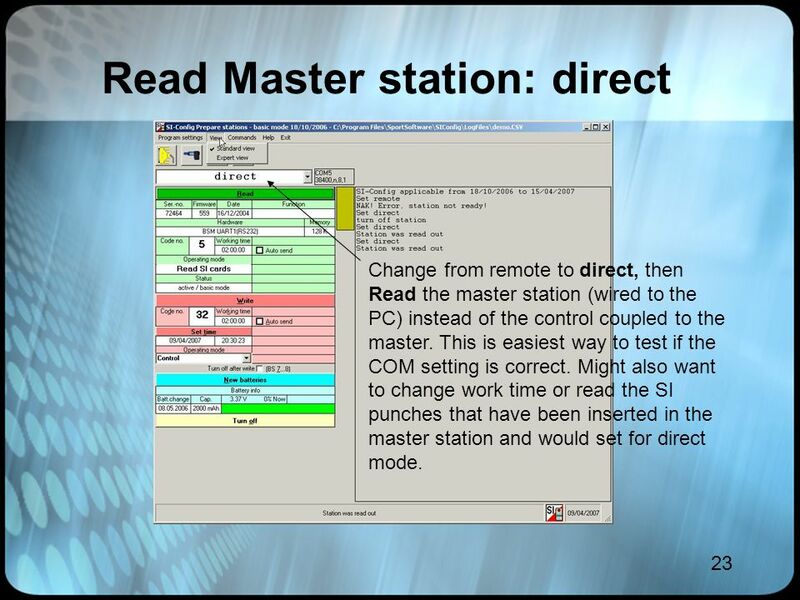 23 23 Read Master station: direct Change from remote to direct, then Read the master station (wired to the PC) instead of the control coupled to the master. 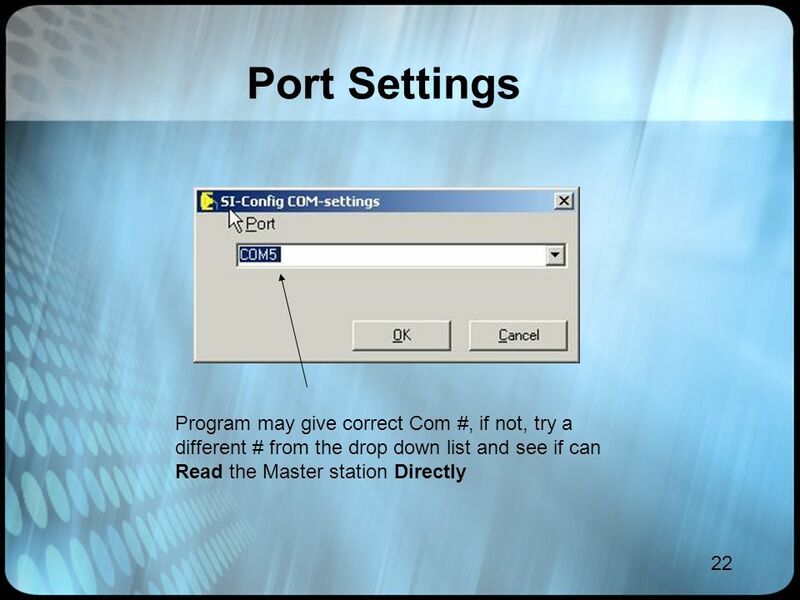 This is easiest way to test if the COM setting is correct. 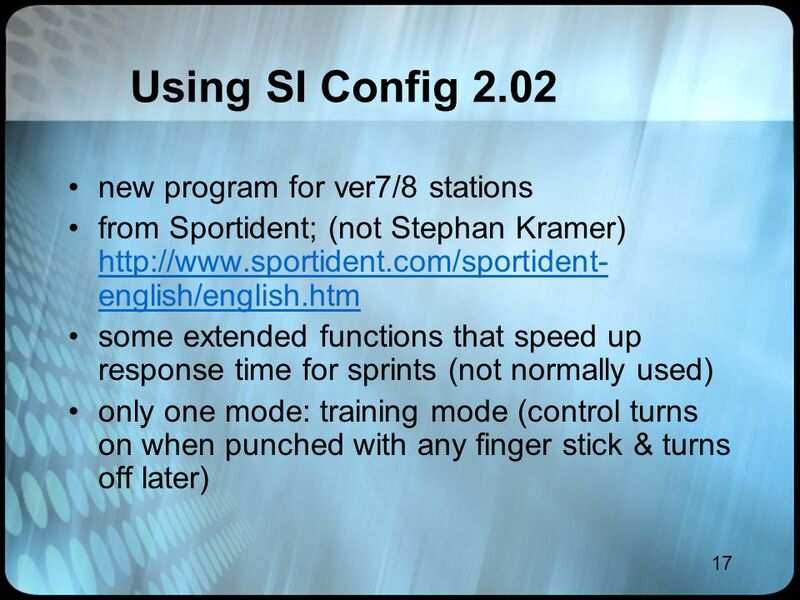 Might also want to change work time or read the SI punches that have been inserted in the master station and would set for direct mode. 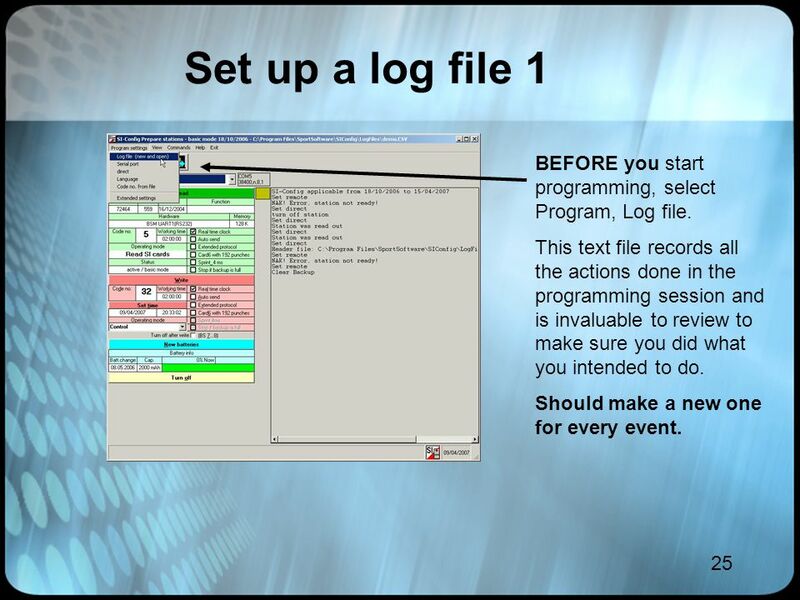 25 25 Set up a log file 1 BEFORE you start programming, select Program, Log file. 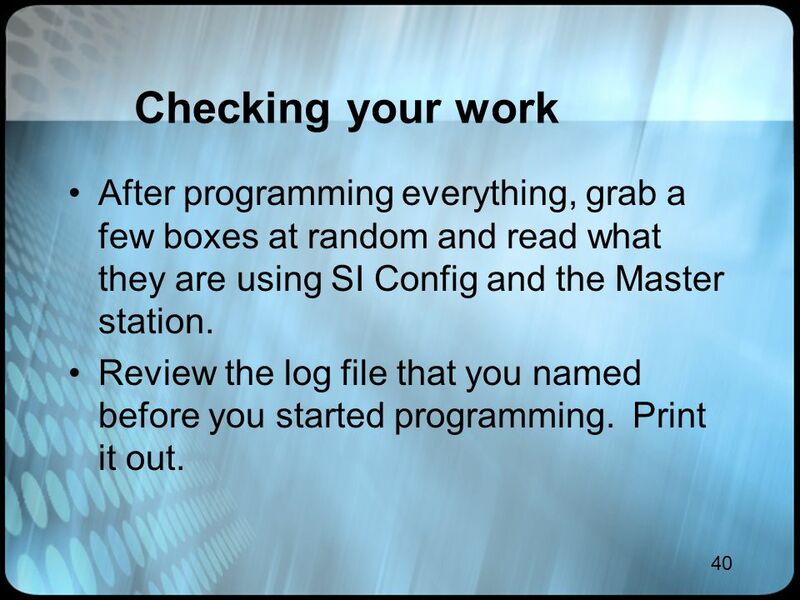 This text file records all the actions done in the programming session and is invaluable to review to make sure you did what you intended to do. 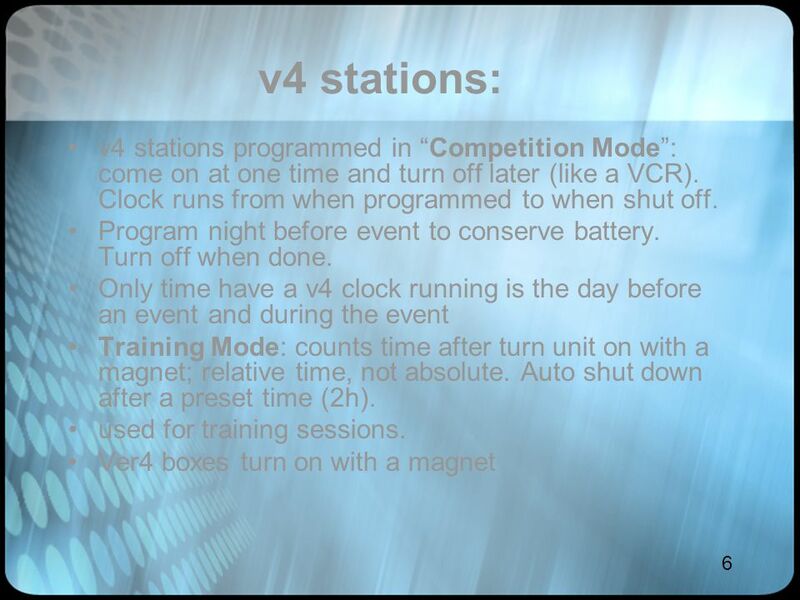 Should make a new one for every event. 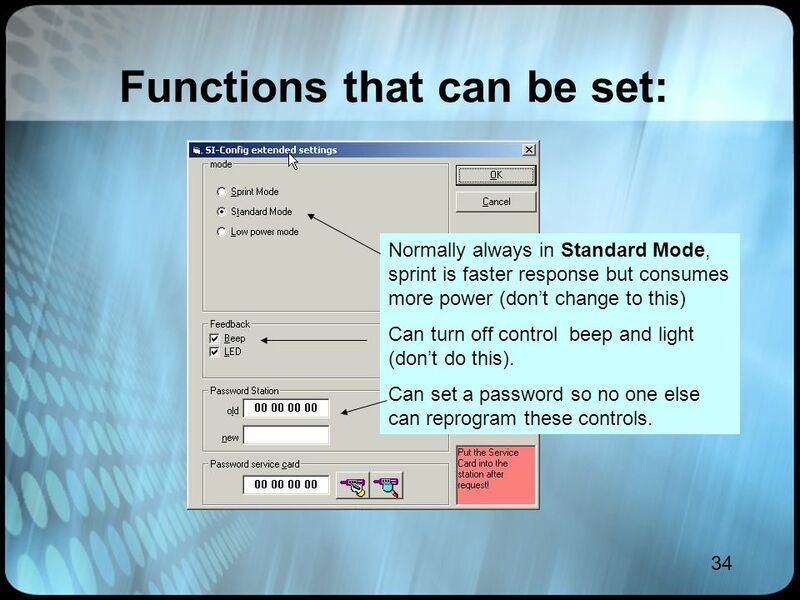 34 34 Functions that can be set: Normally always in Standard Mode, sprint is faster response but consumes more power (don’t change to this) Can turn off control beep and light (don’t do this). 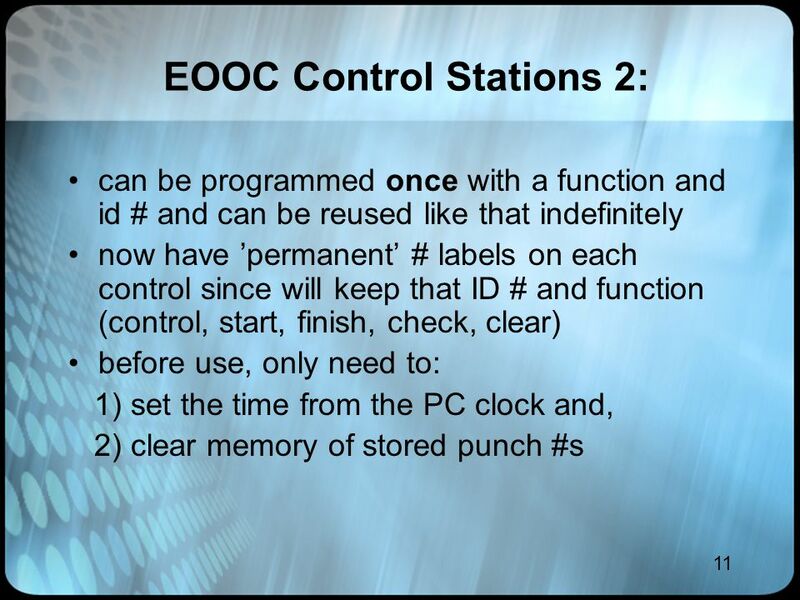 Can set a password so no one else can reprogram these controls. 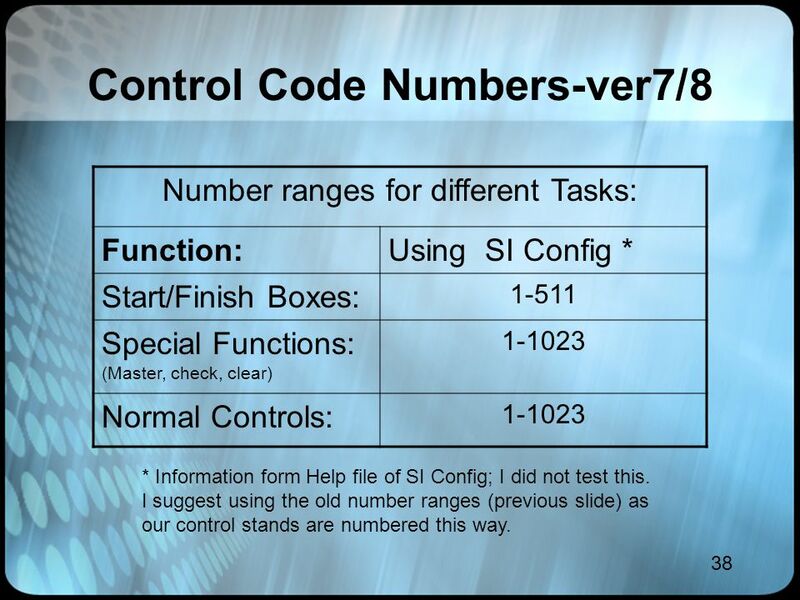 38 38 Control Code Numbers-ver7/8 Number ranges for different Tasks: Function:Using SI Config * Start/Finish Boxes: 1-511 Special Functions: (Master, check, clear) 1-1023 Normal Controls: 1-1023 * Information form Help file of SI Config; I did not test this. 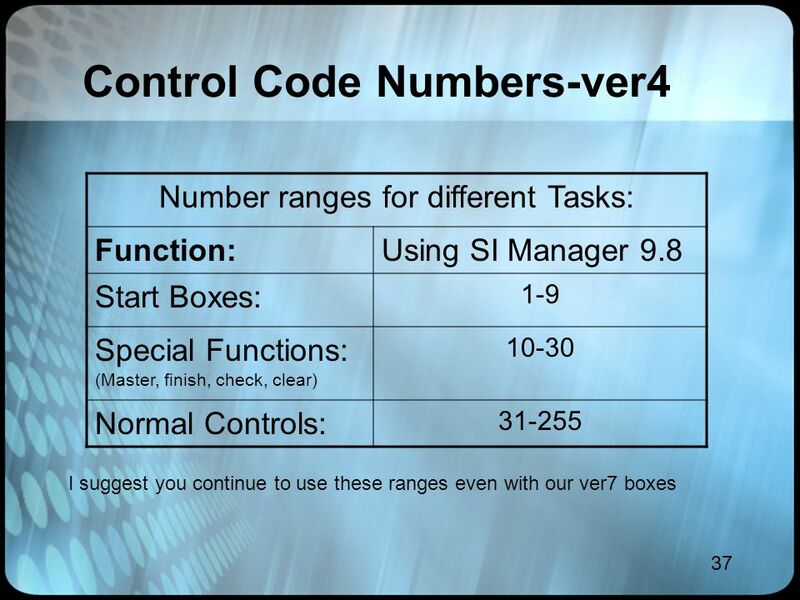 I suggest using the old number ranges (previous slide) as our control stands are numbered this way. 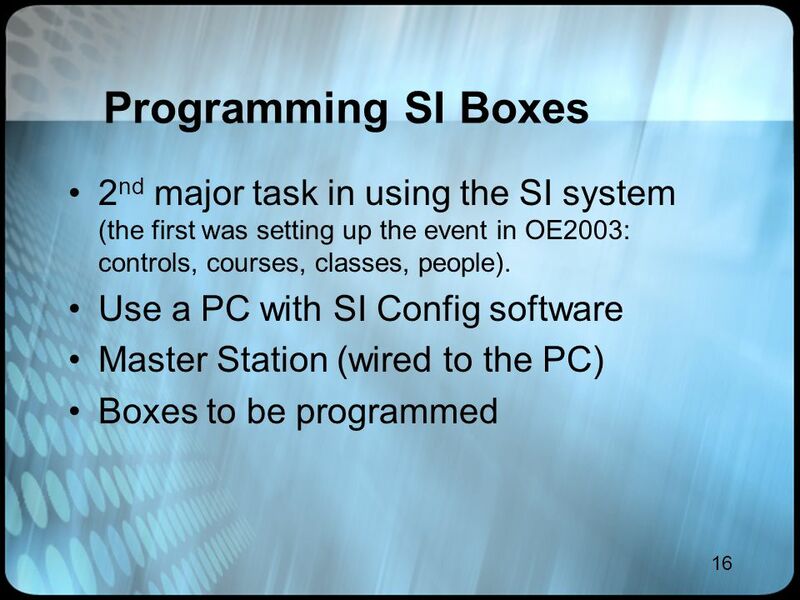 40 40 Checking your work After programming everything, grab a few boxes at random and read what they are using SI Config and the Master station. 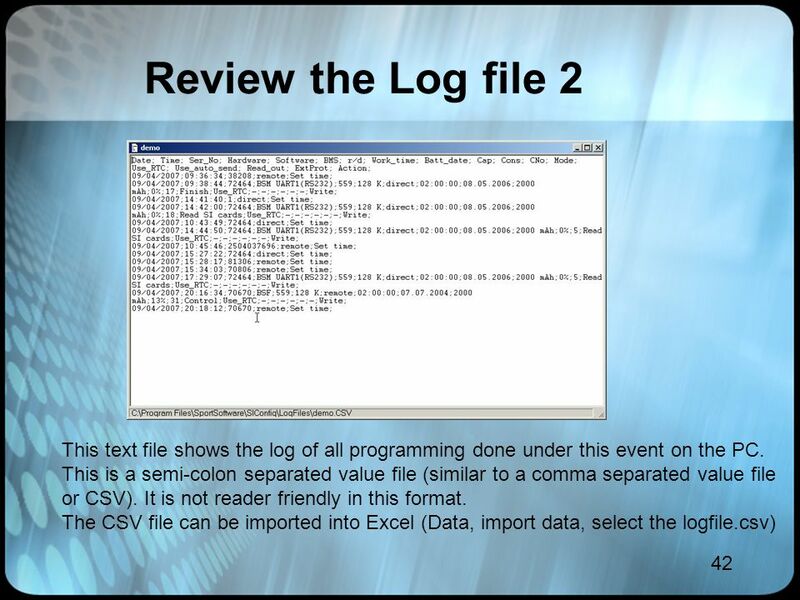 Review the log file that you named before you started programming. 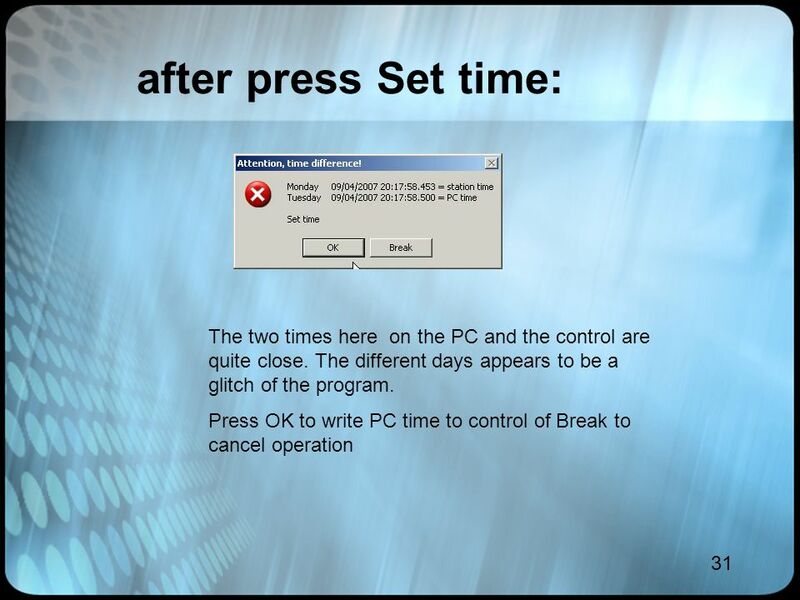 Print it out. 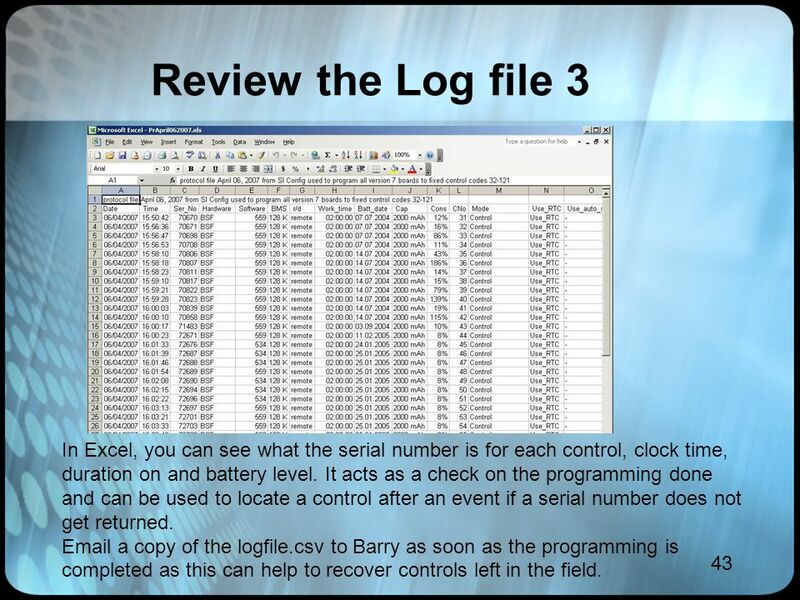 43 43 Review the Log file 3 In Excel, you can see what the serial number is for each control, clock time, duration on and battery level. 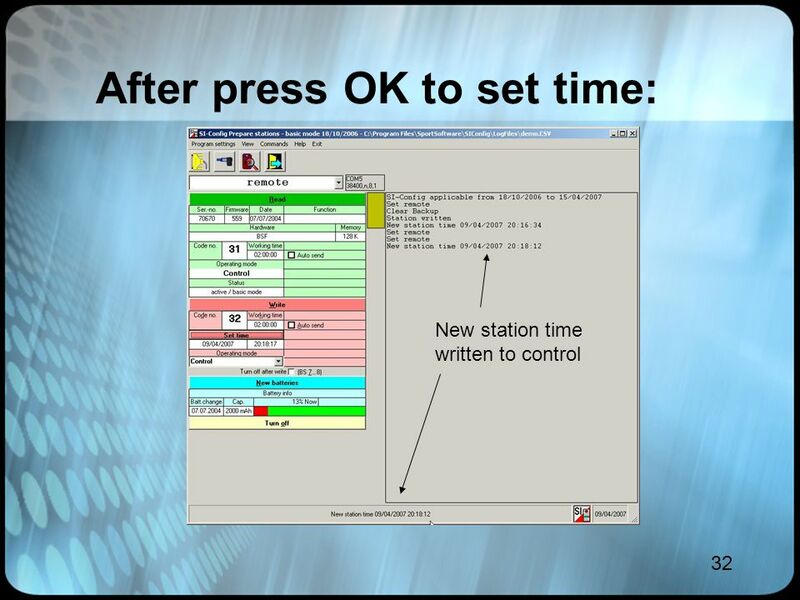 It acts as a check on the programming done and can be used to locate a control after an event if a serial number does not get returned. 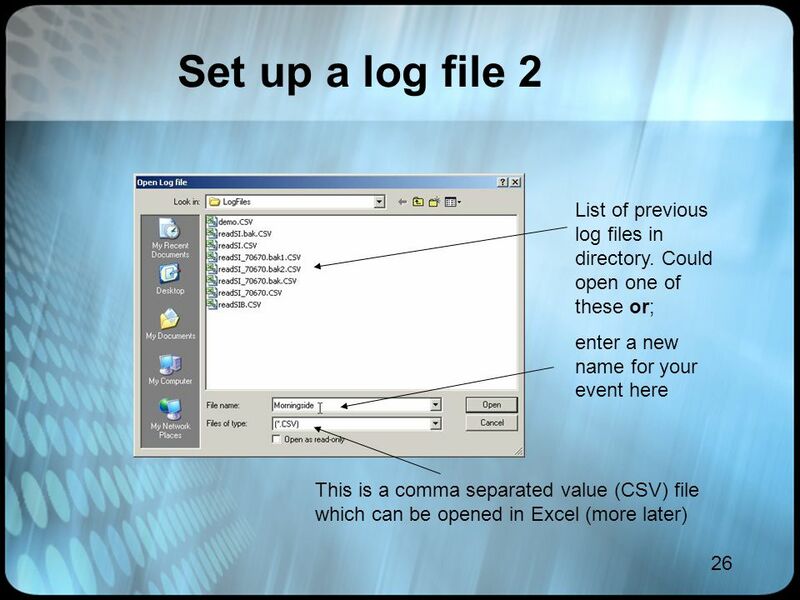 Email a copy of the logfile.csv to Barry as soon as the programming is completed as this can help to recover controls left in the field. 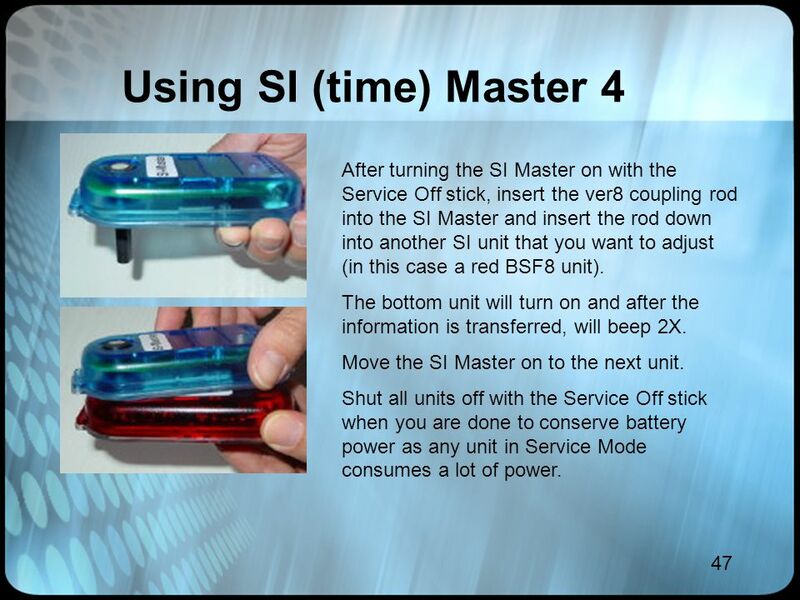 47 47 Using SI (time) Master 4 After turning the SI Master on with the Service Off stick, insert the ver8 coupling rod into the SI Master and insert the rod down into another SI unit that you want to adjust (in this case a red BSF8 unit). 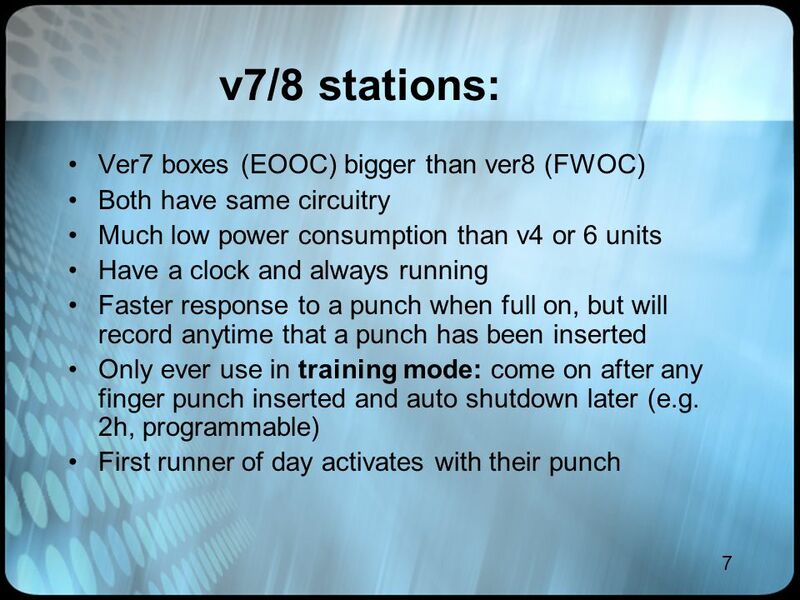 The bottom unit will turn on and after the information is transferred, will beep 2X. 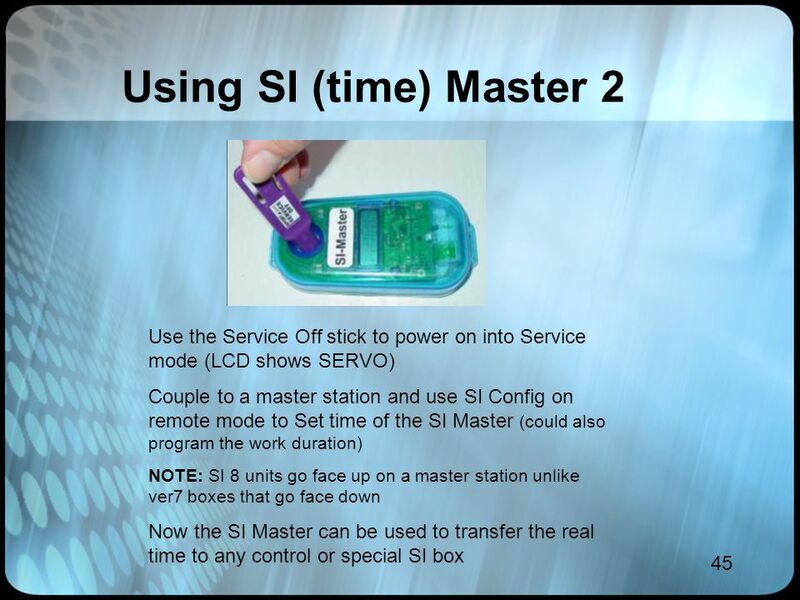 Move the SI Master on to the next unit. 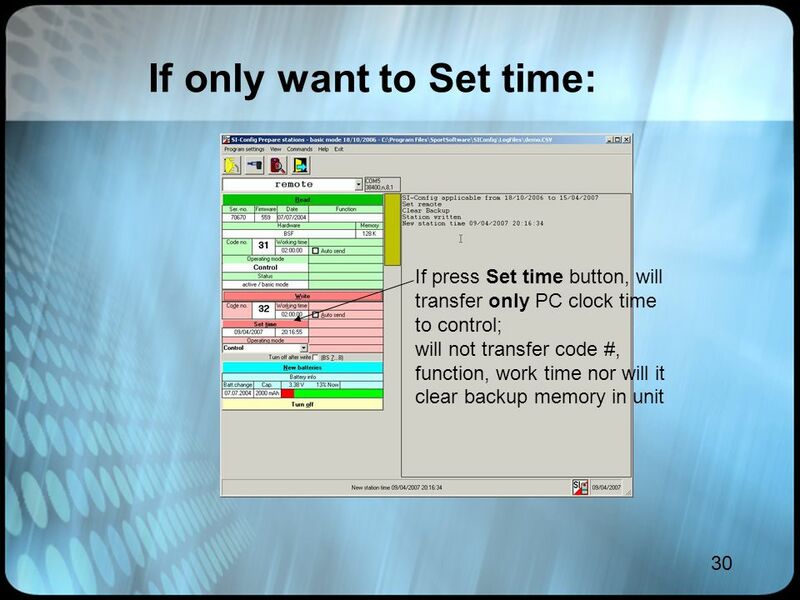 Shut all units off with the Service Off stick when you are done to conserve battery power as any unit in Service Mode consumes a lot of power. 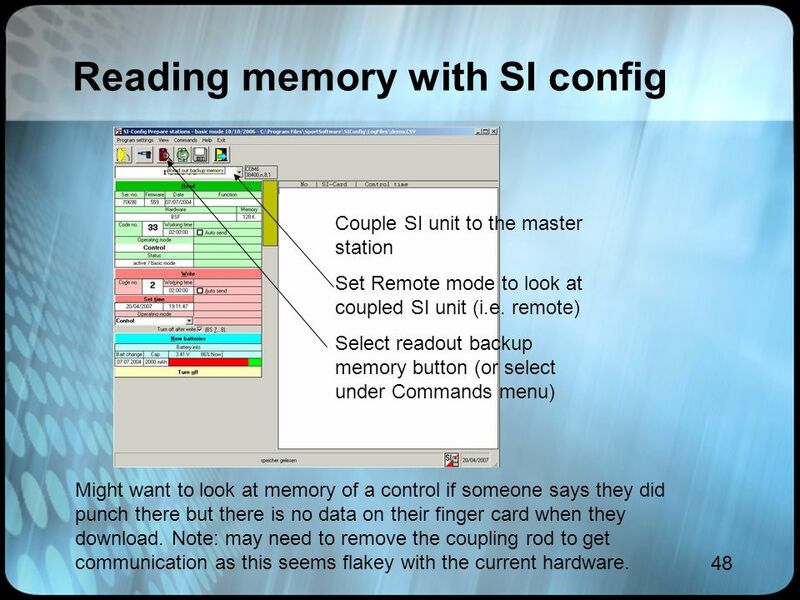 48 48 Reading memory with SI config Couple SI unit to the master station Set Remote mode to look at coupled SI unit (i.e. 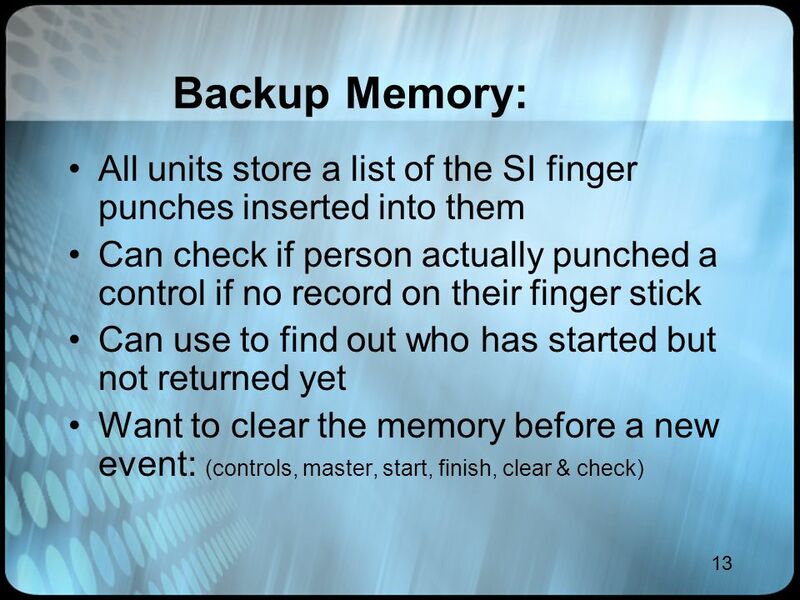 remote) Select readout backup memory button (or select under Commands menu) Might want to look at memory of a control if someone says they did punch there but there is no data on their finger card when they download. 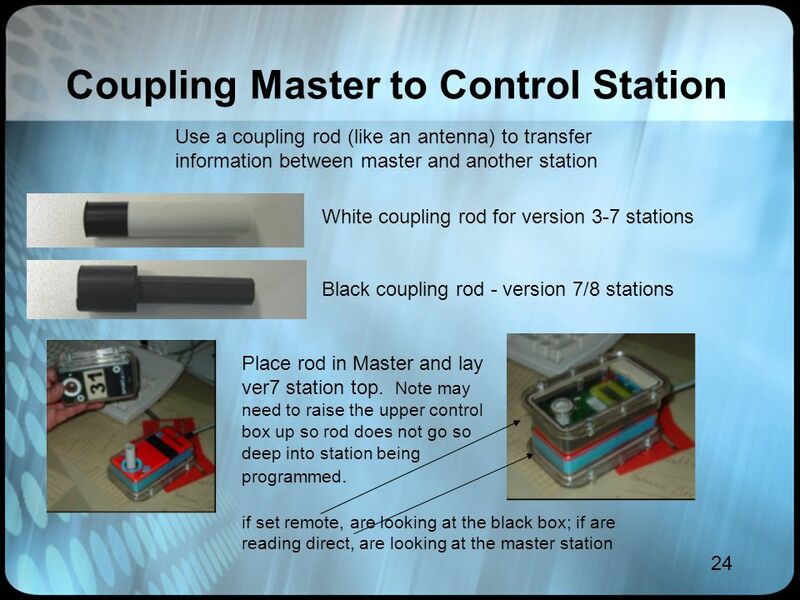 Note: may need to remove the coupling rod to get communication as this seems flakey with the current hardware. 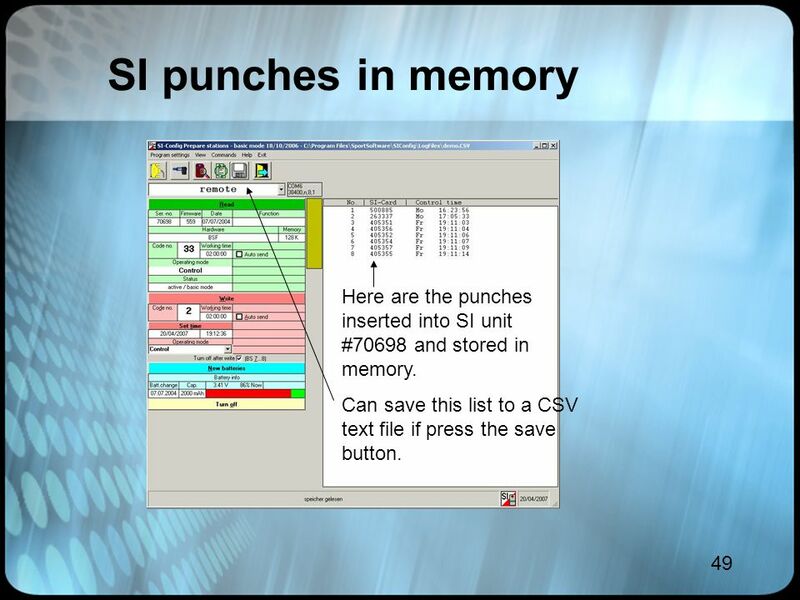 49 49 SI punches in memory Here are the punches inserted into SI unit #70698 and stored in memory. 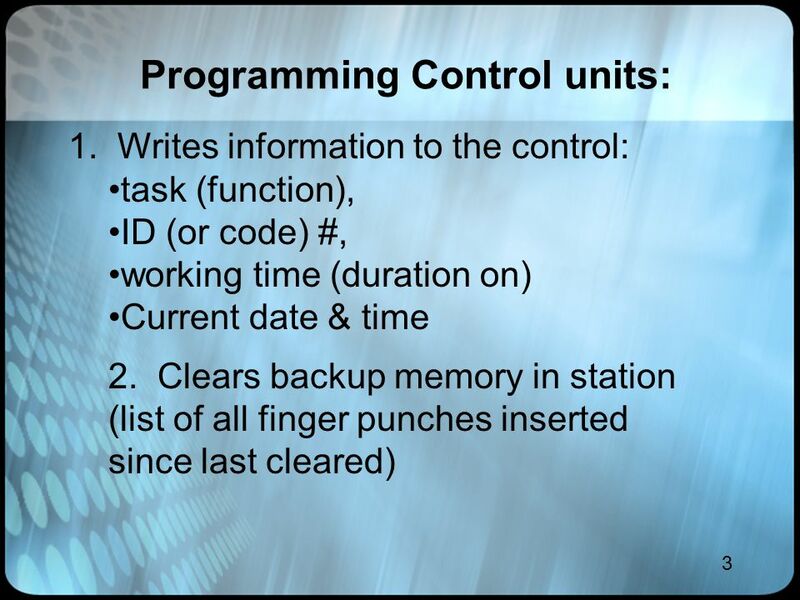 Can save this list to a CSV text file if press the save button. 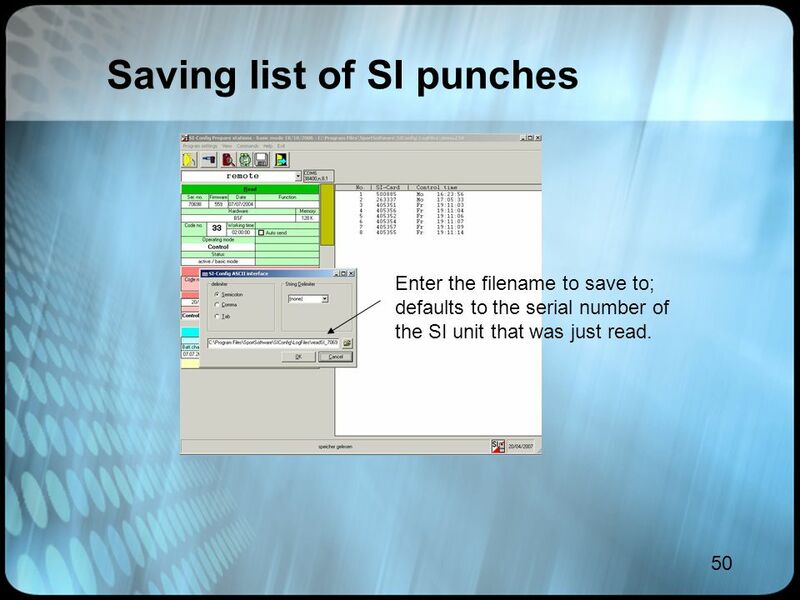 50 50 Saving list of SI punches Enter the filename to save to; defaults to the serial number of the SI unit that was just read. 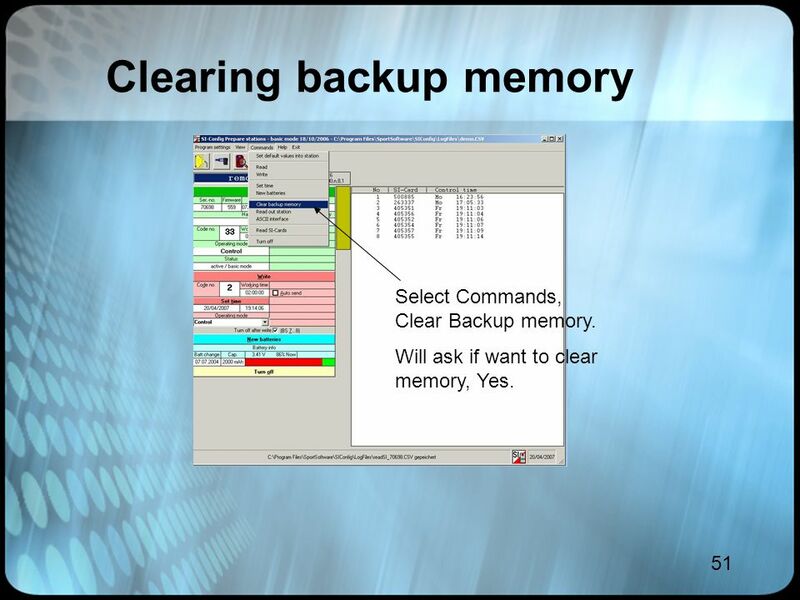 51 51 Clearing backup memory Select Commands, Clear Backup memory. 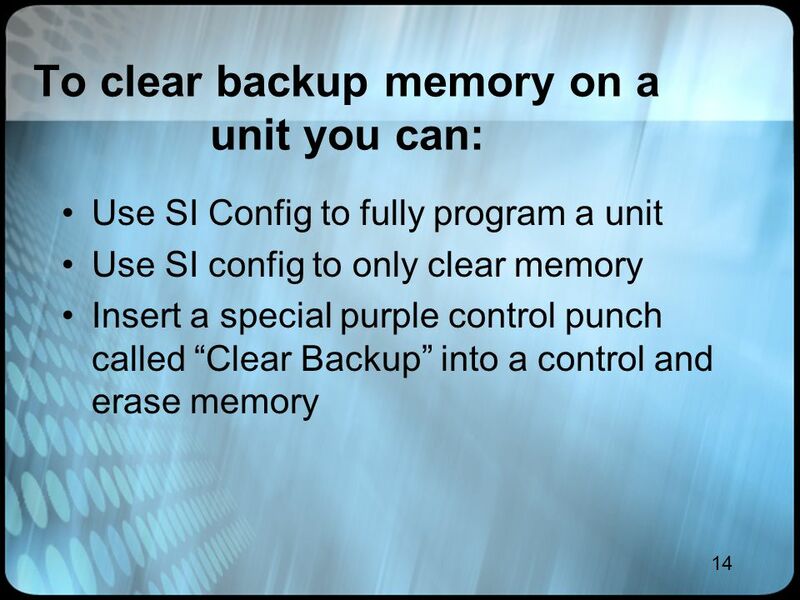 Will ask if want to clear memory, Yes. 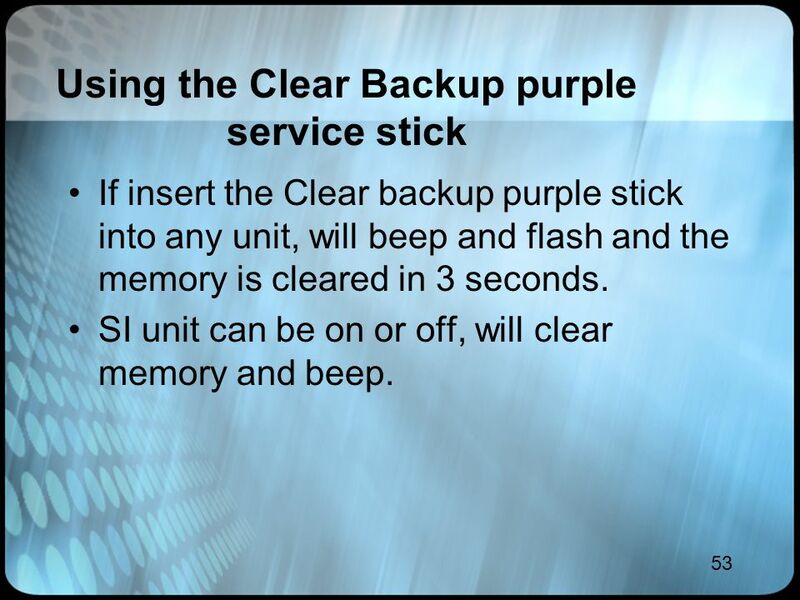 53 53 Using the Clear Backup purple service stick If insert the Clear backup purple stick into any unit, will beep and flash and the memory is cleared in 3 seconds. 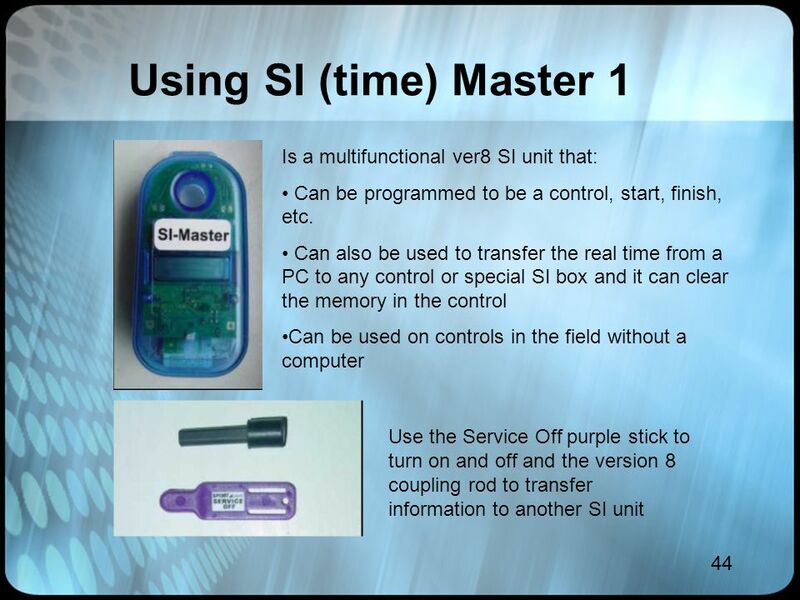 SI unit can be on or off, will clear memory and beep. 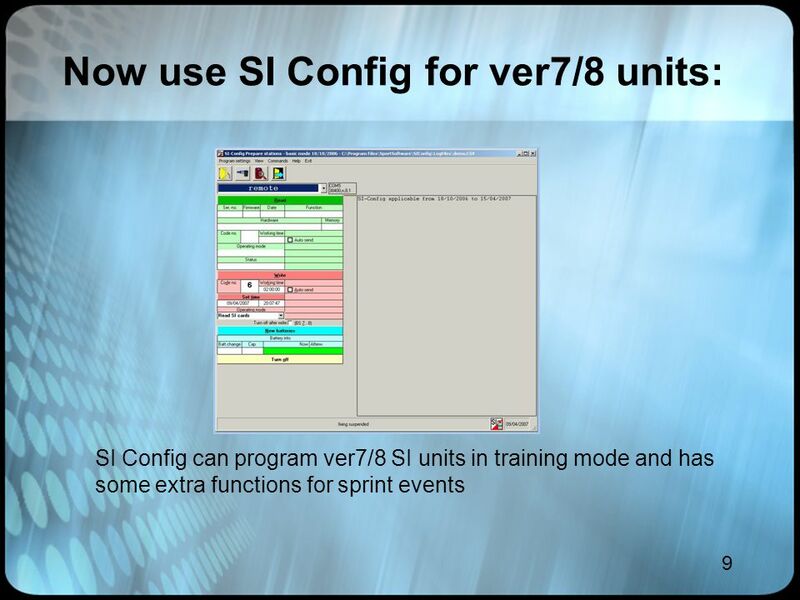 54 54 Summary: Programming ver7/8 Can use SI Config to fully program all SI units as that will set the time and clear the memory in a single write operation. 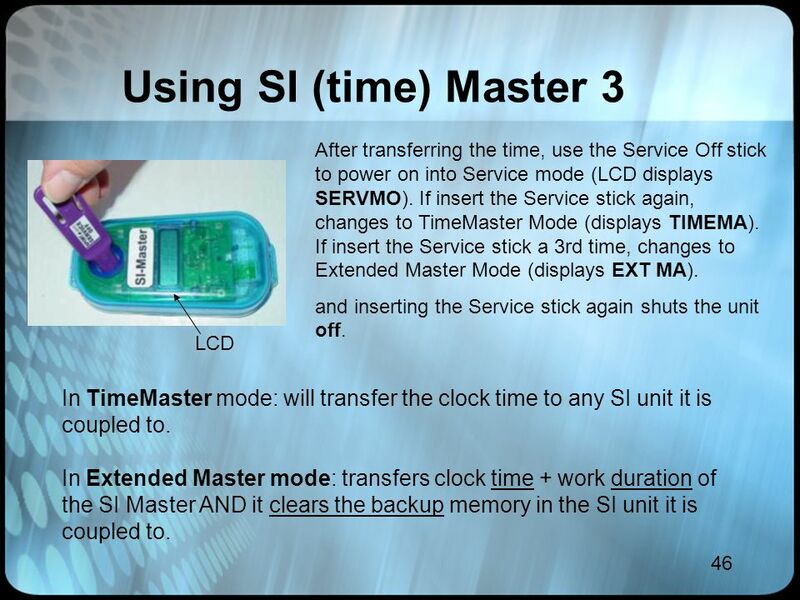 Can use the SI (time) Master after synchronized with PC clock in ExT MA mode to transfer real time, work time and to clear the backup memory. 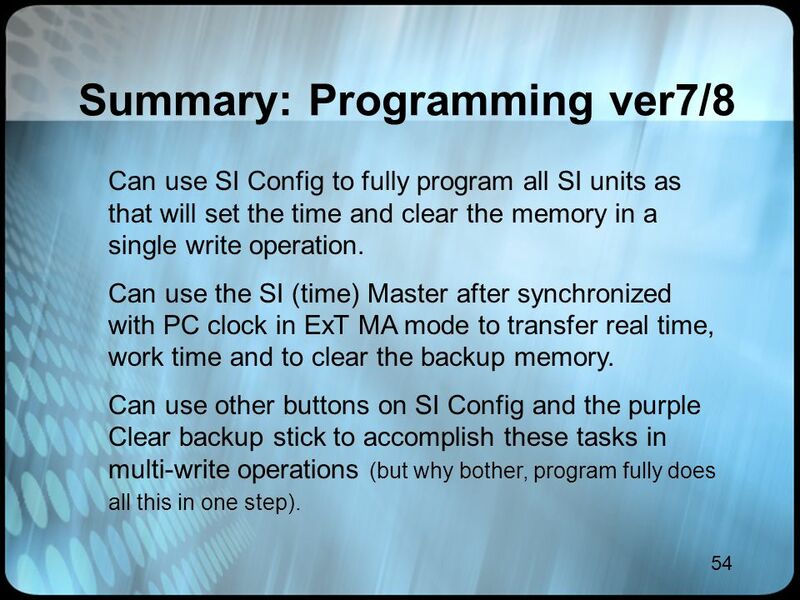 Can use other buttons on SI Config and the purple Clear backup stick to accomplish these tasks in multi-write operations (but why bother, program fully does all this in one step). 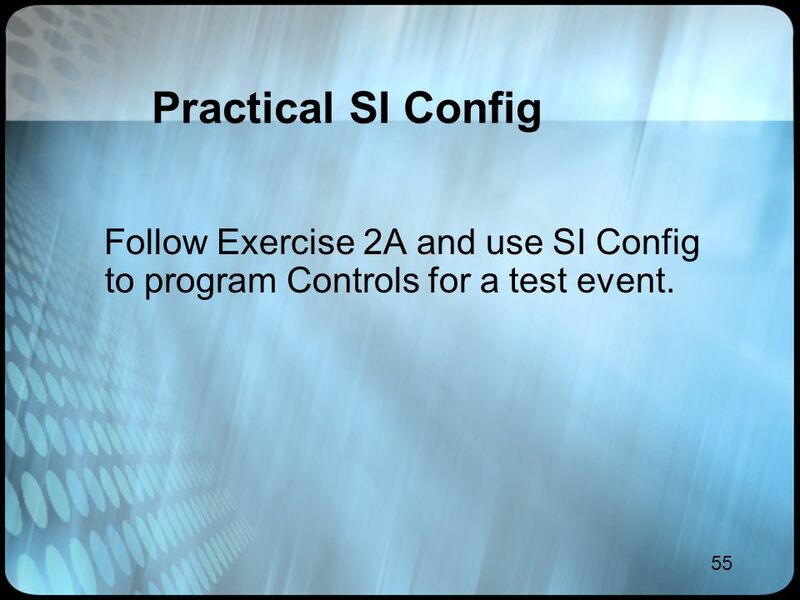 55 55 Practical SI Config Follow Exercise 2A and use SI Config to program Controls for a test event. 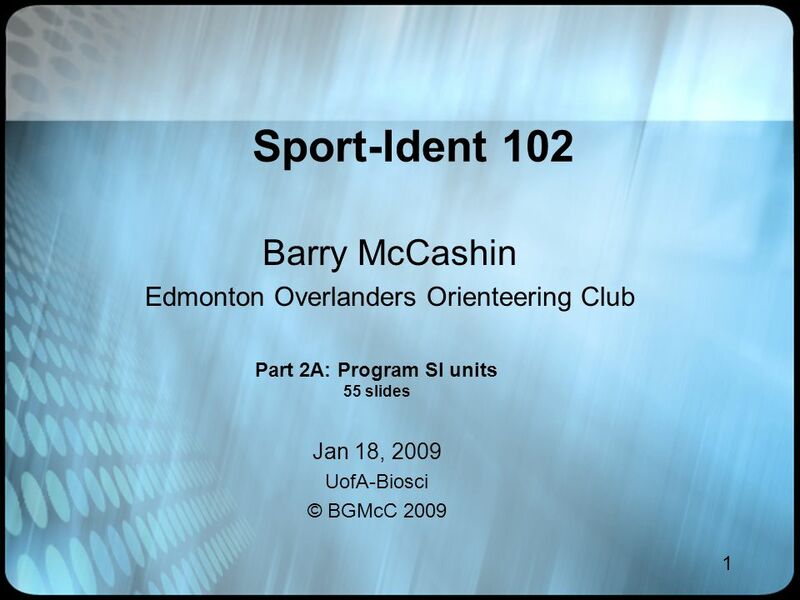 Download ppt "1 Sport-Ident 102 Barry McCashin Edmonton Overlanders Orienteering Club Jan 18, 2009 UofA-Biosci © BGMcC 2009 Part 2A: Program SI units 55 slides." 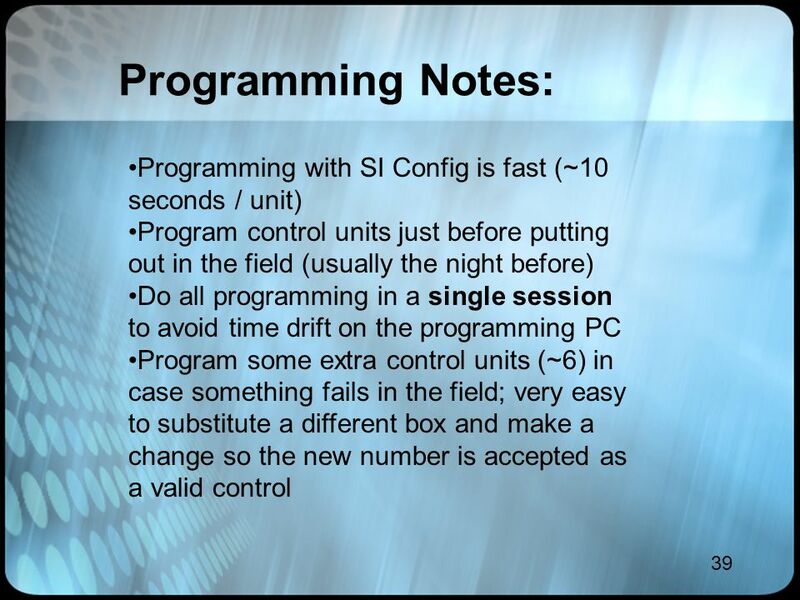 Formatting Long Documents This resource will help you gain the skills to make a long document look good. 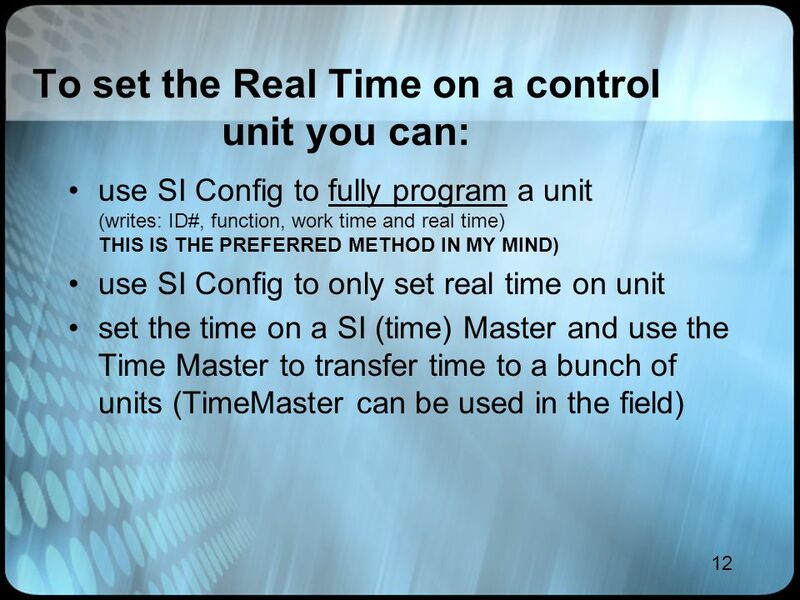 Using these skills will save you lots of time. 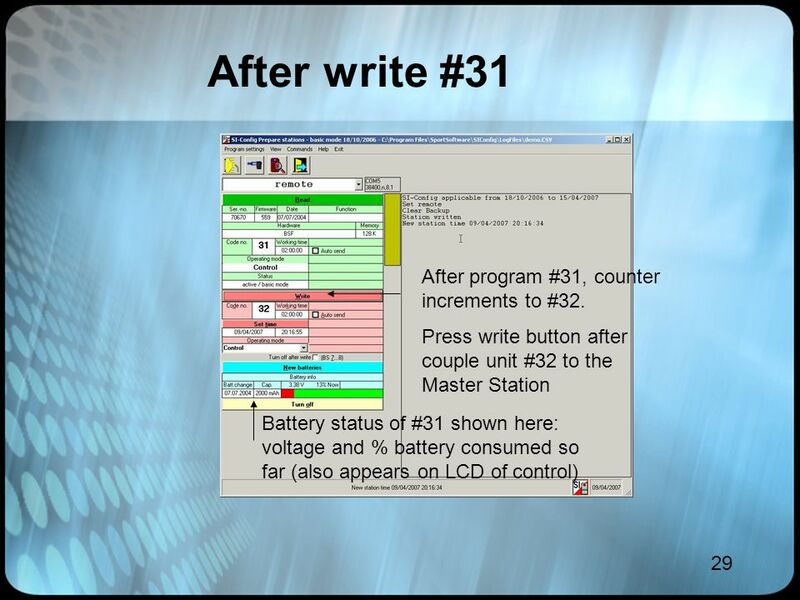 Toshiba Windows 8.1 Laptop Handbook for U3A Convenors Version December 2013 Mike Hender. 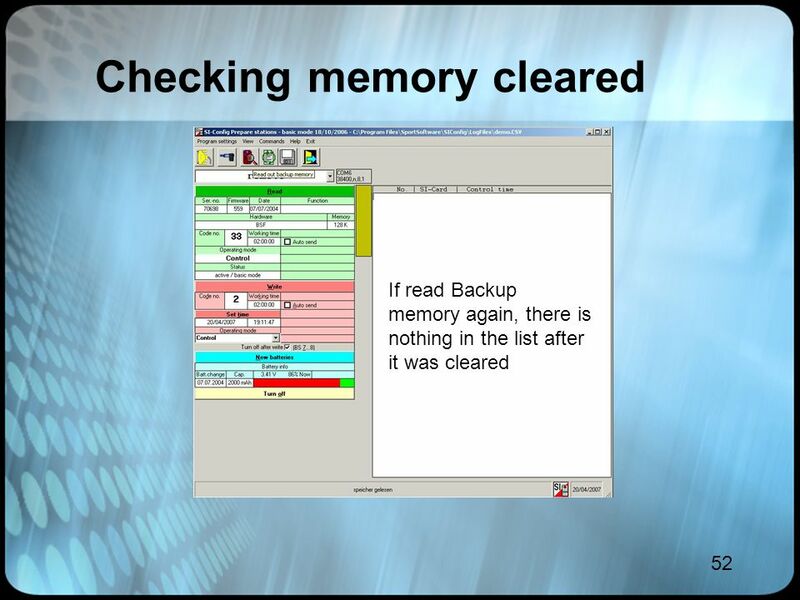 Grade Cam Dustin Foster 2/4/13 Please open Chrome & Login to Skyward. 1 Sport-Ident 102 Barry McCashin Edmonton Overlanders Orienteering Club Jan 18, 2009 UofA-BioSci © BGMcC 2009 Part 0: Intro 20 slides. 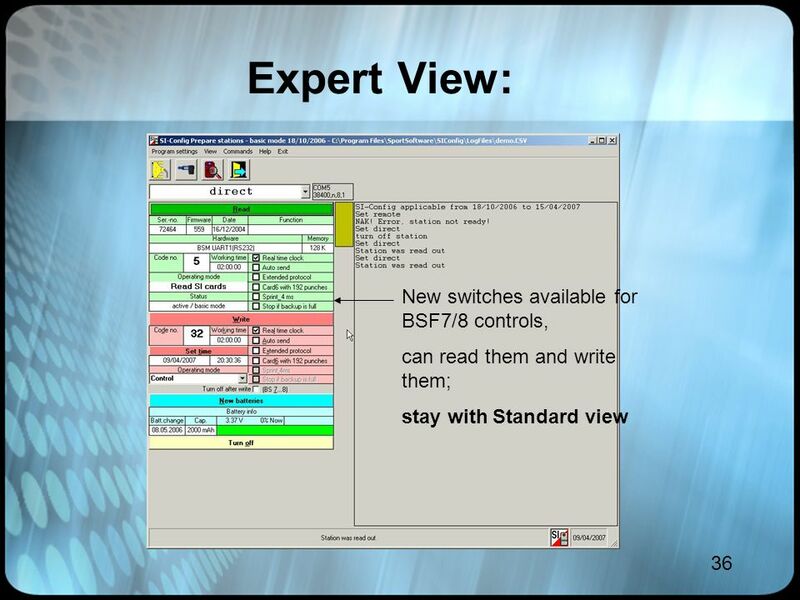 IMac Basics This PowerPoint covers the following: Running XP in different modes through Parallels Running XP in different modes through Parallels Drag. Jason Howard. 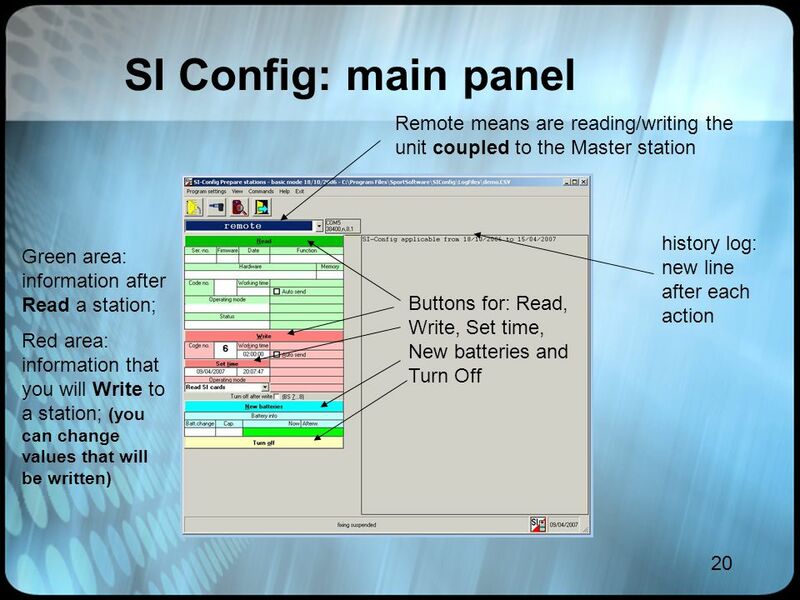 Agenda I. 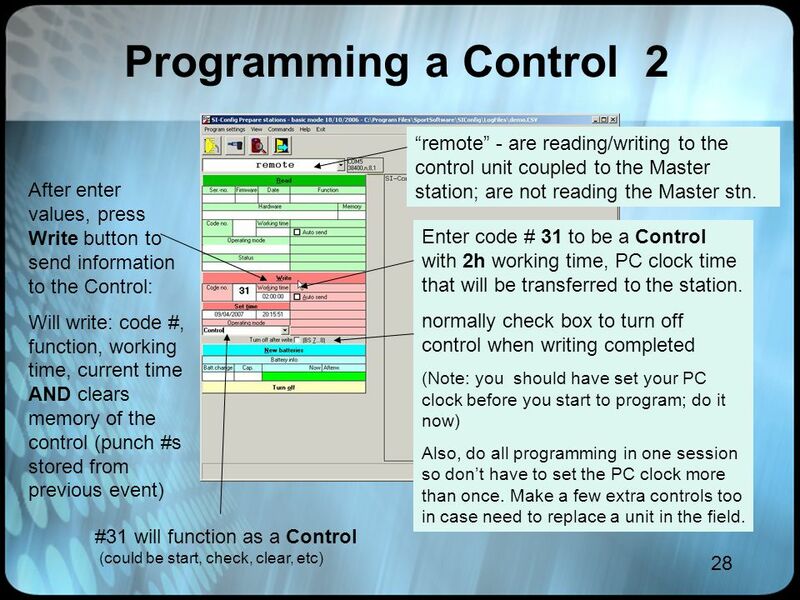 How to download robotc II. 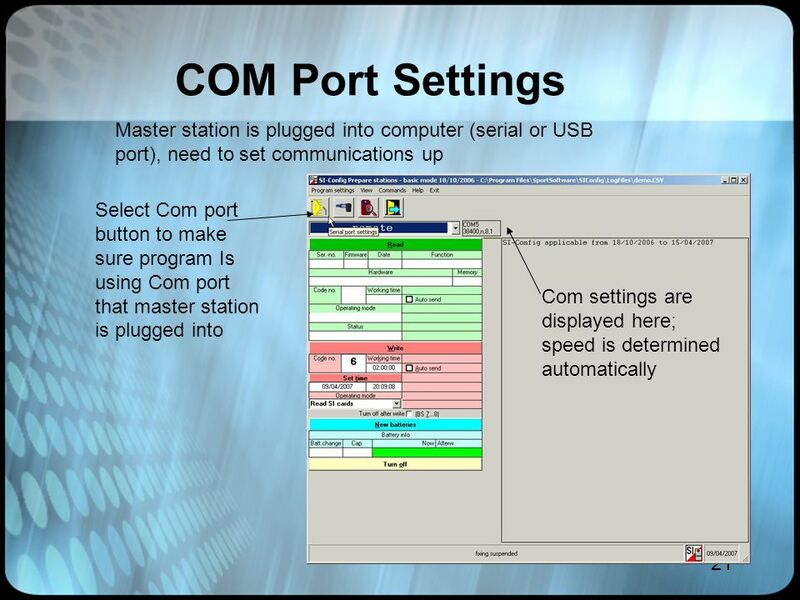 What is tele-op used for? III. 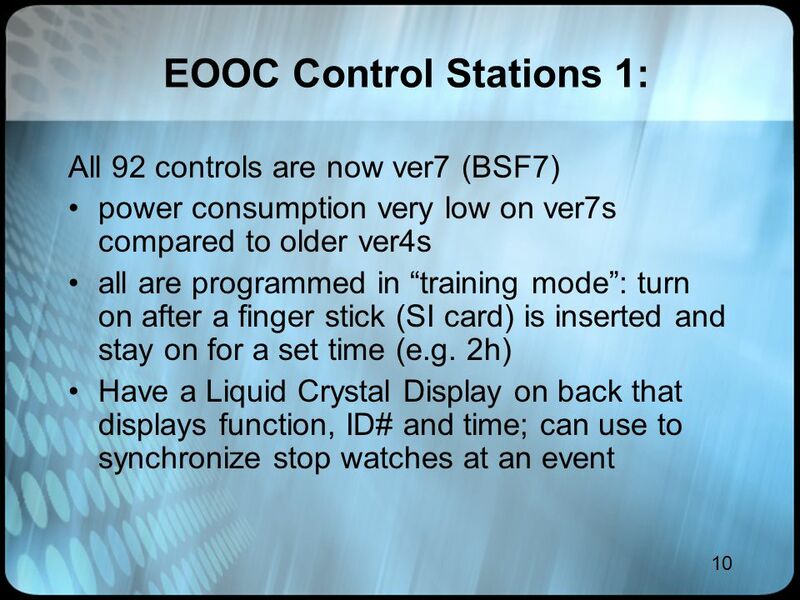 How to build a basic tele-op program IV. 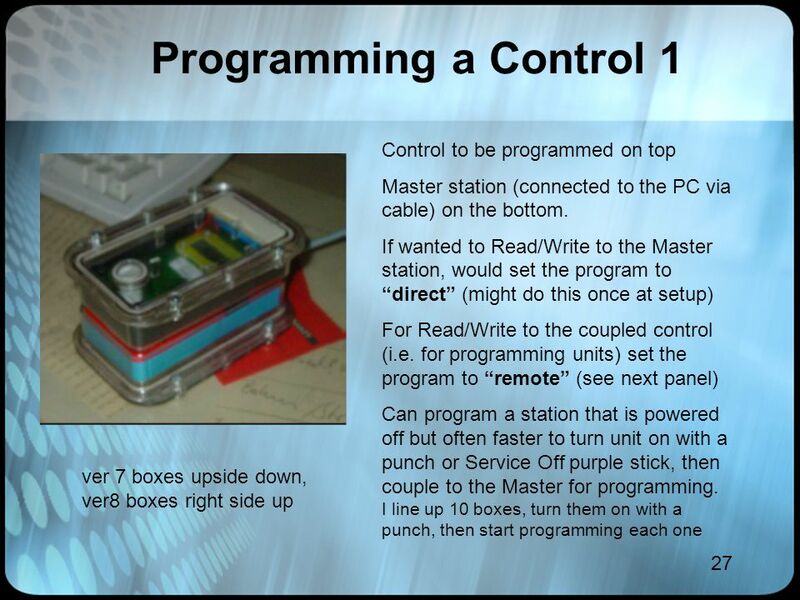 Getting the robot to drive. 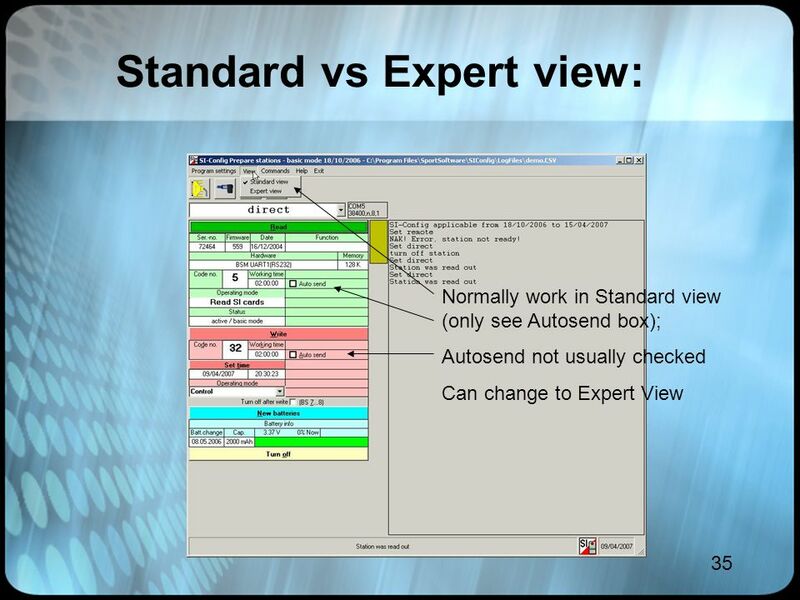 MACREX Indexing Software. 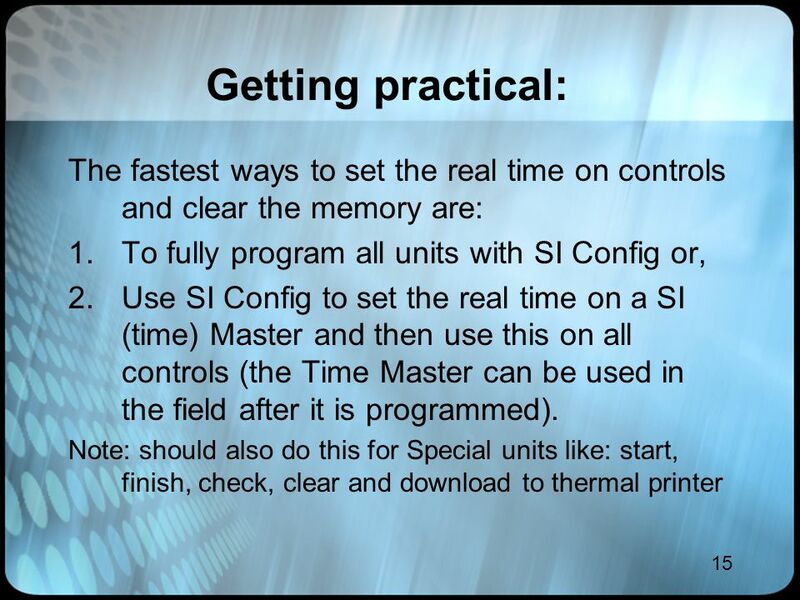 Getting Started: Basic Basics. 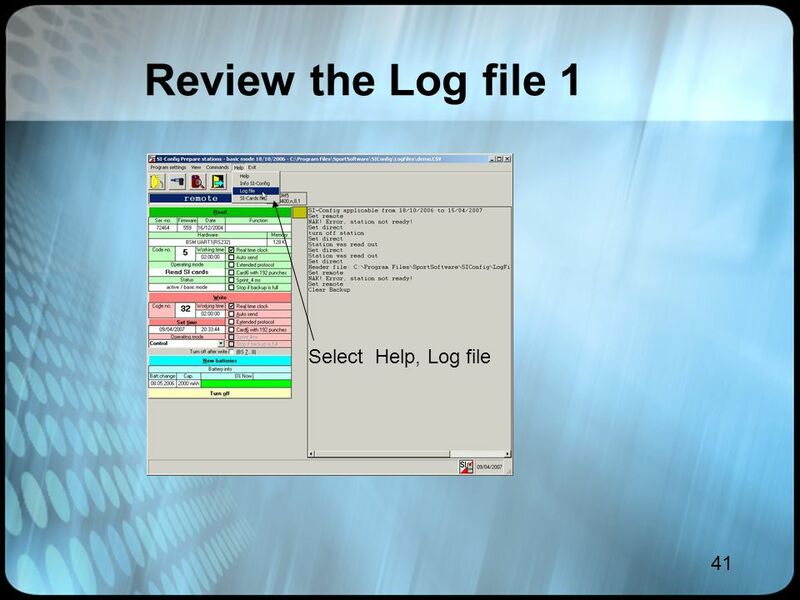 Field Day Logging Software & Paper Logging June 4, 2009. 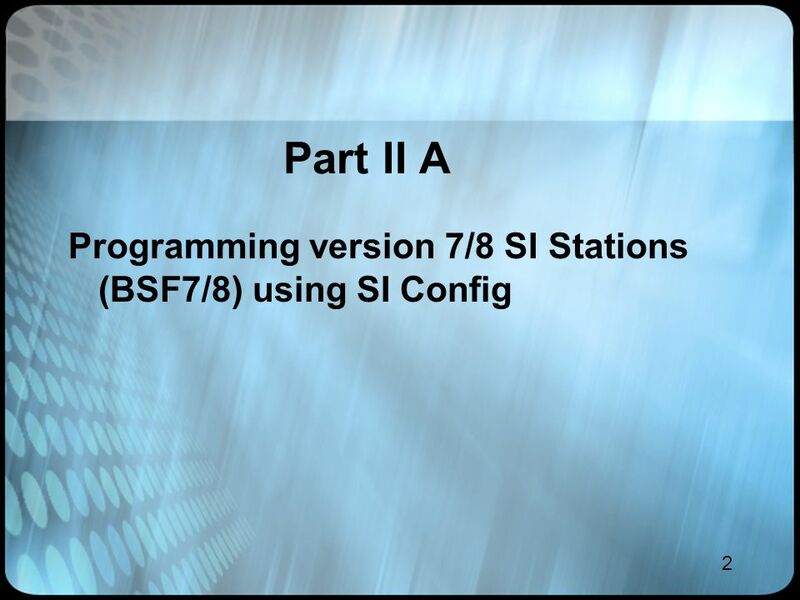 Installing SAS 9.3 Raymond R. Balise Health Research and Policy. 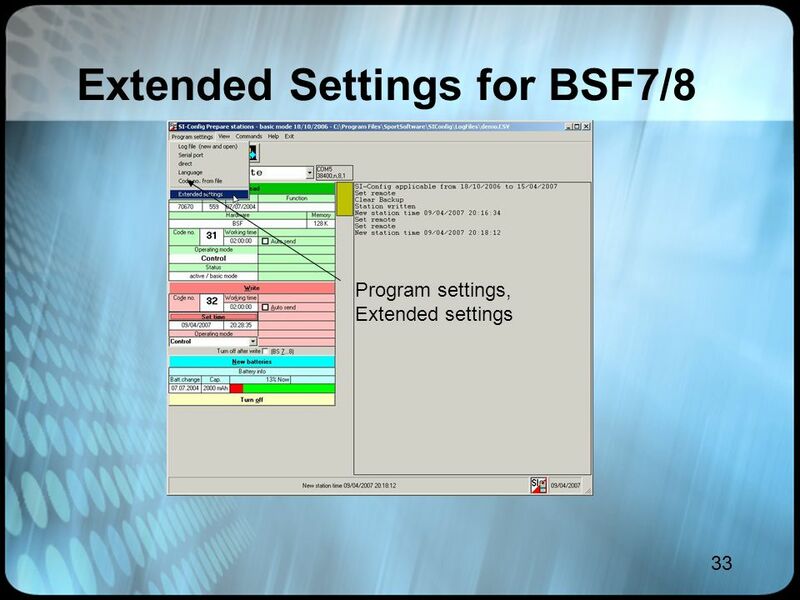  When you receive a new you will be shown a highlighted in yellow box where your can be found  To open your new just double click.